Please note: The Banbury Center is not located at the main CSHL campus. 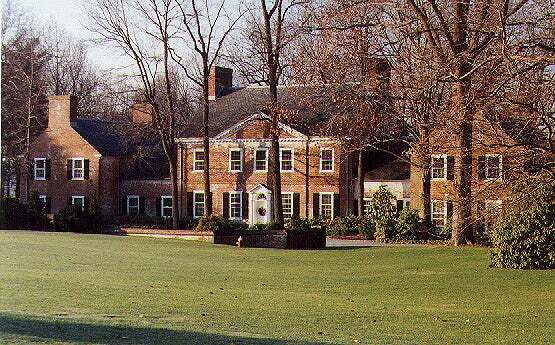 Charles Robertson donated the estate to CSHL in 1976, and its seven-car garage was converted into the “Conference Room”, while the Georgian manor (Robertson) house and two large cottages (Meier House and Sammis Hall) provide accommodation for participants during meetings. The Banbury Center is nestled on a 55-acre estate in the village of Lloyd Harbor, on the north shore of Long Island, about 5 miles from the main Laboratory campus at Cold Spring Harbor. Banbury is convenient to both LaGuardia and John F. Kennedy airports, the Long Island Railroad (Huntington station), as well as the Long Island Expressway and Northern State Parkway. Please note: Banbury meetings are dedicated to scientific discussions, and only invited participants stay here; we are unable to accommodate spouses or guests. The Conference Room is fully equipped with projector and MacOS, Windows computers, and wireless network. Participants walk outside between sessions and meals, and should pack outerwear/umbrellas as appropriate. Smoking is not permitted in any building.